Easily calculate the values required to cut keyseats and keyways. Find the depths to cut in keyway and keyseat. Also calculated are the overall measurements for shaft and bore, as well as the chord height. 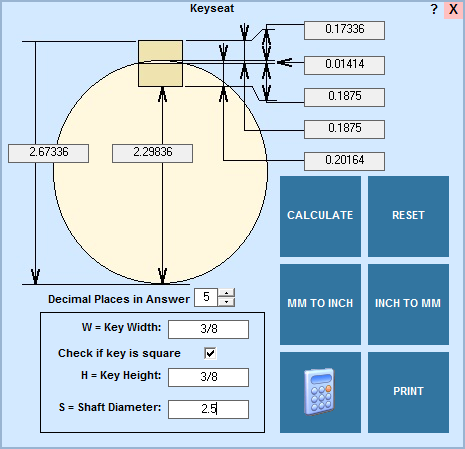 Just enter the size of the key and shaft, then click "Calculate". As with all functions of the Machinist's Calculator, linear values can be converted between inch and millimeters, including the x,y coordinates in the answer.